First Usage,please install and debug as manual. Sensitivity debug,we suggest that in lowest position in maiden flight,and according to add 5 mins range Each to process the Test flight adjustment.When the flight controller factory settings,in 50% position,please do not put the set factory settings as standard,and adjust right sensitivity according to your airplane and power parameter. P1-GYRO Products in A3 on the basis of three-axis stability augmentation to increase the flight control switch control mode and the axis lock (AVCS) mode. This mode uses the angle vector control algorithm, the aircraft angle of around three axes of motion detection and correction in real time offset , the aircraft has always maintained the ability to pose on a time and trends , so called lock. Locked compared with the ordinary horizontal mode , the lock mode can not only greatly enhance flight stability , even in the absence of control ( off control ) in the case , to achieve self- hoists, and other difficult moves side to fly. P1-GYRO Products added a switch channel is used to switch modes during the flight ,you can use a three -stage switch in the general augmentation , triaxial lock (AVCS) and gyroscopes closed three kinds of flight between modes at any time switch to experience a completely different flight fun. 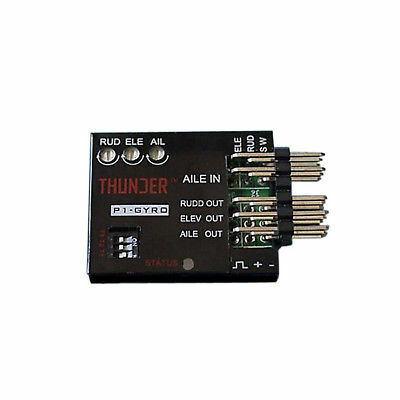 P1-GYRO Products flight control of the aircraft electric oil moving aircraft wingspan unlimited size , general- flight controller. Flight line controller can improve aircraft performance and controllability of the aircraft . Meanwhile various effects can be offset by the state aircraft external factors such as ease of stall of the aircraft, or had bad shape design to fly aircraft. Well as wind and airflow , etc.,automatic flight control can offset these negative factors . Precision three-axis flight control on the right rudder gyro can make rapid and sensitive unstable airflow offset compensation operation of the aircraft in flight more stable and straight ,to a certain extent in the wind will not be bumpy .